Lesley Kagen is going to be Guest Posting Here on May 4. The Paperback Version of her latest book, Good Graces, is being released on May 1. Since Lesley is a Wisconsin Author I am going to continue to follow I have moved this post over from the original Dollycas’s Thoughts. This review was posted there September 20, 2011. This book was recommended to me by author Rochelle Staab when we “met” discussing her new book coming out in November, Who Do, Voodoo?. I was thrilled to learn she was from Wisconsin and she told me I had to read this book and that I would want to read it’s sequel too, Good Graces. Thank you Rochelle!!!! 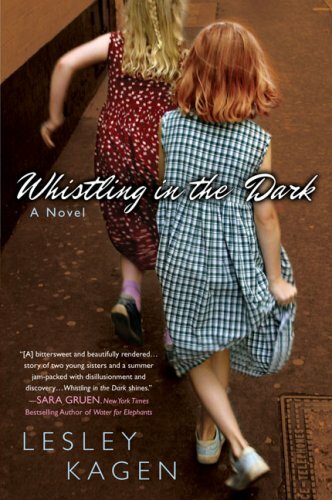 Whistling In the Dark takes place in Milwaukee, Wisconsin, in 1959, and is written from 10 year old Sally O’Malley’s point of view. She has a little sister Troo, and a older sister Nell, her father was killed in a car accident, her mother then married Hall who is not much of a step father. Her mother ends up spending most of the summer in the hospital due to complications of surgery. Nell is caught up with her boyfriend and Hall is busy with another woman or has drown himself in liquor or both. The two little girls are left on their own but it is back in the time when your neighbors knew everybody and everybody watched out for each other. Sally and Troo were fed and taken care of my the good folks of the neighborhood. The area is living in fear of a child molester and murderer. Two little girls have gone missing and one was found dead in the park where Sally and Troo play everyday. Sally is sure she will be the next victim. She even believes she knows who the killer is and will do everything she can to keep her and her sister safe. There are so many reasons I loved this book. First Sally has a very active imagination just like I was told I had while growing up so it was so easy to relate to her. I wasn’t born until 1961 but references in this book were true to what I remember or had been told as I grew up. 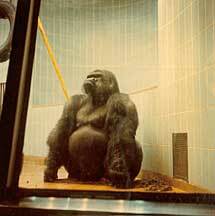 The trips to the zoo brought back such memories. There must to be very few people from Southern Wisconsin that do not remember going to see the Gorilla named Sampson at the Milwaukee Public Zoo! Beyond the memories this story churned up, it is marvelously written. Funny, surprising, and full of charm yet tragic in places. Sally’s innocence will have you laughing one minute and wiping a tear from your eye the next. All the characters were wonderfully created. The story reminds us of simpler times, when kids played outside until the streetlights came on and the neighbors watched out and took care of your skinned knees or brought out a plate of cookies to share. I understand completely why it was a national bestseller. This book is definitely a must read, plus a sequel to the book Good Graces that came out in September and I can’t wait to get my hands on it. I am anxious to read everything by this author. This new mystery series introduces us to Darcy and Harper Merriweather. They have come to Salem, Massachusetts and the Enchanted Village to help their Aunt Ve in the family business. You see, they come from a long line of witches, specifically Wishcrafters, they can make wishes come true. The news of their history is quite a surprise but they are going to embrace it and learn all about it with the help of Aunt Ve. The first thing they learn is that the village is inhabited by witches and mortals and telling who’s who is not an easy task. Shortly after arriving in the village a mortal that wants to be a witch is strangled with dear Aunt Ve’s scarf. The body is found by Aunt Ve’s sweetheart, Sylar, and he ends up being accused of the crime. Ve believes he didn’t do it and the girls would do anything for their aunt. Unfortunately you can’t just wish for the truth to appear. In fact there is a whole manual on Wishcrafting and there are so many rules. So Darcy starts by doing some old fashioned detective work, a little breaking and entering, and some eavesdropping to put all the clues together. Who knew magic could be so much work? I wish this story never ended or that the next one was in my hands today. This is a fun little mystery and a really delightful story. Murder, magic, mystery, they just naturally go together. A little romance adds to the fun. The Enchanted Village is truly a magical place, full of whimsical characters. A place where wishes come true and spells are cast. A place where the familiar becomes extraordinary. A place I would love to visit often. I wish I could go there now. Sadly, no Wishcrafters around here today, but A Witch Before Dying will be out in August. I will just have to wait. Until then you can enjoy It Takes a Witch: A Wishcraft Mystery. It is just the book you have been wishing for. Be sure to visit Heather’s Site! Lauren Matthews was just starting her legal career nine years ago when the case of a lifetime was handed off to her. She was successful, the jury found the man guilty of murder and sent him to prison. Now she finds out the man was innocent. How could she have been so wrong? There is only one thing she can do. She must find him and beg him to forgive her. The idea that is was her determination and drive that sent an innocent man to prison is eating her alive. Arlen Fieldstone has lost nine years of her life because of her. To get to Arlen she has to go through his best friend, Will, the man that was there to pick up the pieces after his friend’s release. He remembers Lauren from the trial and he holds her responsible for his friend’s fate. He is not about to let her near his friend just to ease her pain. These people’s lives collide. The outcome is yet to be determined. Will they each get what they need to move on with their lives? This story was much more than I expected from the snippet I saw prior to receiving a review copy. There are so many layers to this story and to each character’s life. The author peels the layers slowly drawing the reader further and further into the lives of Lauren, Arlen and Will. She does this with the skill of a true storyteller. She also lets the reader get comfortable with the characters and then throws in a zinger that sends us reeling. Masterful, just plain masterful. With my blogoversary this week I didn’t invite any author to guest post, but I wanted to share with you a great cozy coming out next week. 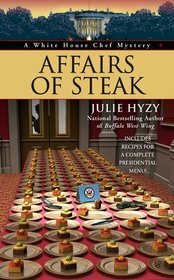 Julie Hyzy writes the White House Chef Mystery series and the next one Affairs of Steak (A White House Chef Mystery) comes out January 3, 2012. The first lady is throwing a birthday party for the Secretary of State to show the world that while her husband, the President, and the Secretary are from different political parties they get along very well. The problem starts when Ollie, the White House Chef, and the thorn in her side, Peter Sargeant, the White House Sensitivity Director, are assigned to work together to find a venue outside of the White House to hold the party. After a rough day of visiting different places, neither one of them agreeing on anything, they finally arrive a the last choice, Lexington Place. They are escorted to the banquet area and are waiting to meet with one of the first lady’s assistants. As Ollie gets tired of waiting she decides to check out the kitchen where she finds the assistant, but she is very dead and when police arrive another body is found, that of the chief of staff. With the assistant’s death Ollie and Sargeant are assigned the job of organizing the party, but they are also going to have to work together to find a murderer. Their own lives are on the line. Did they see something they shouldn’t have? Before they become the next victims they need to put their differences aside and find the killer. A good portion of this book takes place outside of The White House so we see a little more of Ollie’s personal life. She has the perfect neighbor. Everyone needs a Mrs. Wentworth next door. Ollie’s love life is also evolving in a way both Mrs. Wentworth and I approve of. The interplay between Sargeant and Ollie was unexpected, cleverly written, moving at times, as well as funny. Their relationship was taken to a new level that I really enjoyed. The total ineptness of the “interim” head usher just added to this multi-layered mystery. Ollie spent almost as much time in his office as the kitchen and she has a much higher patience level than this reader. I would have been so fired. The entire story is superb. 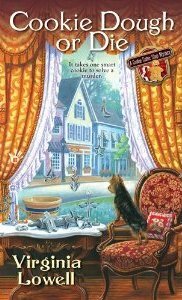 This is one of my favorite cozy mystery series. I look forward to each and every trip to The White House with Ollie. Julie never fails to cook up a marvelous mystery and Ollie takes us right into the middle of the fray. 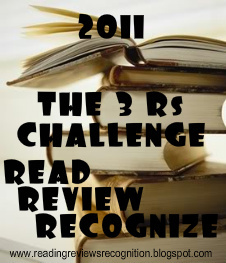 Be sure to add the to your new year reading lists! Welcome to Cozy Wednesday! I am thrilled to welcome Virginia Lowell, author of the Cookie Cutter Shop Mysteries to Escape With Dollycas Into A Good Book. After reading the first book in the series Cookie Dough or Die I knew I had to invite her to my blog, not only because I liked the book, but because she is a complete mystery herself. She has added a web page, but no Facebook page or even a picture of Virginia has been leaked. I love mysteries so I am glad she is here today and that we get to learn a little bit more about the author behind these delicious stories. Thanks so much for having me here today. I admit I’ve haunted Cozy Wednesday, searching for new series to read, so I’m delighted to be included. The opportunity started me thinking about how much I’ve enjoyed hearing from—and learning from—cozy readers since the first book in the Cookie Cutter Shop series came out. Many readers have asked about my characters, especially Olivia and her best friend since age ten, Maddie. Am I like them in any way? Do they represent people I know? How did I create them? I decided it would be fun to muse a bit about those questions. I grew up in a small midwestern town, and that experience formed me. In a small town, everybody knows everybody, for better or for worse. Resentments can run deep and last for decades or more. At the same time, we had to learn to get along as best we could. If your neighbor is the only dentist in town, it’s a good idea to keep disagreements under control. Dentists have drills, and they know how to use them. Part of me wishes I were back in my little hometown, and the other part (the writer-with-a-deadline part) couldn’t stand the interruptions. If one more person drops by to chat, I might have to do away with her. I guess that makes me more like my murderers? But am I like Olivia or Maddie? I wish. But I have given Olivia and Maddie some characteristics I’d like to possess. The truth is, I’m not as focused as Olivia, and I don’t have her business sense. Numbers confuse me, I never know what time it is, and I often get lost. Olivia would never mistake north for south, as I inevitably do. And Olivia is taller. Much taller. I think we do share an interest in people, in what makes them tick. For me, creating and developing characters over time is one of the greatest joys of writing the Cookie Cutter Shop series, though writing about cookies is a close second. Maddie, too, is taller than I am, and she has far more energy. But I do enjoy Maddie. If the pace of a story is slowing down, I know Maddie will add a spark simply by walking through the door. I share Maddie’s antipathy toward math and her love of color. However, she is a computer whiz, which I am so very not. And I can only aspire to create cookies as lovely as hers. Here’s where Olivia, Maddie, and I are most alike: None of us can resist a mystery. Are Olivia and Maddie like people I know? I don’t ever base a character on a real person, but I might notice physical characteristics, mannerisms, ways of speaking, and personality traits that might pop up in a character. I’m a people watcher, as are most writers. I know people who are compassionate, rather than judgmental. I like that trait, so I gave it to Olivia. I know individuals who are exuberant, with an infectious sense of fun, like Maddie. But neither Olivia nor Maddie is really like anyone I’ve ever known because they have other qualities, as well. They also have personal histories that helped to form them. As for how I create characters, it is through a combination of brainstorming and… mystery. I wish I could claim that I have each character mapped out ahead of time, but that would be fiction. I start by brainstorming what role the character might play in the story, physical characteristics, personality traits, and past, using what I call bubble diagrams. (I thought I invented the process until my husband informed me there are numerous books about “mind mapping.” Bummer.) Once I have a sense of the character, I put him or her in a scene with other characters. That’s when I discover I’m not really in charge. The character might show a softer side than I’d planned for her. Or the shy, serious one has a twinkling sense of humor. Who knew? It takes time for their secrets to emerge. I may think I know the identity of the murderer, or even the victim, but more often than not I am wrong. Don’t ask me to explain it; I’d rather not know why it happens this way. Because, hey, I’m a mystery reader, too, and I don’t enjoy a predictable ending. What fun would that be? Thank you for stopping by today Virginia!! You keep creating characters and we will keep reading and eating way too many cookies. SUGAR KILLS! or at least that is what Charlene Critch, owner of The Vegetable Plate wants you to believe. Her fliers are found all over the yard of the Olivia’s and Maddie’s store,The Gingerbread House. When Livie decides to confront Charlene about the mess, she finds Charlene’s store has been trashed and sees a man running out the back door. Of course Charlene doesn’t believe Livie’s story about the intruder, but even against the wishes of Sheriff Del Jenkins, Livie gets involved in the investigation. When she finds a dead body in the park that looks suspiciously like the intruder she knows there is more to worry about than the “DEMON SUGAR”. There is a murderer on the loose in Chatterley Heights! Virginia Lowell has whipped up an intricate plot, added colorful characters, a dash of humor and a pinch of romance to create the perfect cozy mystery. While Olivia is the star, Maddie is my favorite character. I would love to have just half of her energy. She is dealing with some issues in her past so we get to see her vulnerable side as well. The fact the Livie and Maddie have been friends since childhood just touches my heart. That they can work together and be involved in each others lives 24/7 reveals an unbelievably strong bond that is truly a treasure. A very entertaining read but beware you will either have to urge to start baking cut-out cookies or eat a lot of them. Wonderful for this time of year or in my case year round. Virginia Lowell is the national bestselling author of the Cookie Cutter Shop mystery series. 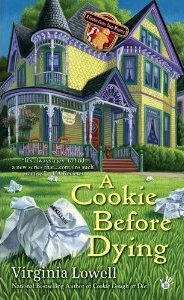 Join Olivia and Maddie as they bake and sleuth in A Cookie Before Dying, their second adventure in the series. The first installment is Cookie Dough or Die, and the third, When The Cookie Crumbles, will be released in August 2012. These stories feature a clever black and white cat named Sheena, who goes on adventures with her family the Allens. In this story she stows away as they enter a new section of the Baragandiri National Park. Sheena has her own adventure as she helps a young meerkat that has been poisoned by a scorpion. She ends up making friends with his whole meerkat tribe and learns that they are at war with another meerkat tribe that lives on the other side of the gorge. The whole issue is which tribe lives under the “one true sun”. Sheena goes on quite a journey as she tries to bring these two meerkat tribes together. This was quite a story. I enjoyed it and I think older kids through seniors citizens would enjoy it as well. There is a bit of death and scary things that would keep me from reading or recommending it to younger readers although my grandson loved the pictures on the back cover and wanted to know about the animals. The book seems to have been extremely well researched and actually had me studying about the amazing creatures in this book after I finished the story. I think it would be a great book to add to middle school, junior high or high school reading lists as it covers many subjects, from geography to science, and has a good message about relating to others believe differently than you and getting along with everyone. The sketches in the book are wonderful as well. This is my first adventure with Sheena and I will be picking up the first two and reading along as the series continues. H. S. Toshack has lived and worked as an English teacher and educational consultant in the UK, the Caribbean, Africa, Thailand and the Middle East. He now lives and writes in Portugal…and travels, still. His Paka Mdogo stories are set in Africa, but they are coloured by his experience of people, and lives lived, in all of those other places; and he intends to take his cat heroine Sheena, in future books, to some of them (perhaps Thailand next). 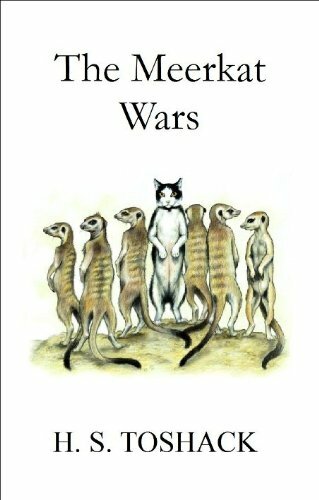 All three books are published in the UK, and ‘The Meerkat Wars’ has just been launched in the US. Judge Deborah Knott and Sheriff’s Deputy Dwight Bryant have been married for a year but have yet to take honeymoon. His sister-in-law has offered them her apartment in New York while her tenant is away in Europe. Part of the rental agreement was that she could use the apartment when he was away and she has given a week to Dwight and Deborah as a Christmas present. They have also been asked to deliver a package to a friend’s daughter who lives in New York. They arrive in New York and after a series of phone calls learn that the friend’s daughter is out of the country, but her granddaughter, Sigrid Harald, a lieutenant for the NYPD, will pick up the package. But when she arrives the package is missing and the building superintendent is dead. Deborah and Dwight just can’t stand by and not get involved in the investigation. They team up with the lieutenant to catch a killer. If the name Sigrid Harald looks familiar to fans of this author it is because she is the main character in Margaret Maron’s other series. In this book the series collide to solve this murder in the Big Apple. It was nice to see Sigrid back in action and the hint that she may be visiting Colleton County in the future. After the last book in this series it was nice to have change of setting. Colleton County had enough drama and it was nice to have a little break. But the author adds a little mystery to remind us of the Deborah and Dwight’s North Carolina home. Maron is an excellent storyteller and masterfully plotted a story featuring both her star characters together into this book. The New York characters were quite a change but the one that had be laughing out loud was Luna DiSimone, thinking everyone from the south had to be related, her apartment was quite interesting and the dialogues were priceless. An array of plot twists keeps the reader on their toes and this reader was very surprised at the end. 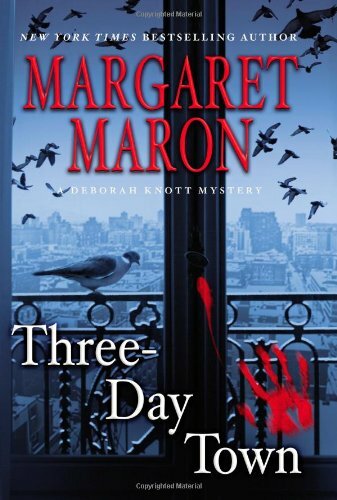 To find out more about Margaret Maron and her wonderful books check out her web page. We return to Colleton County, North Carolina just in time for the holidays. Sadly they are overshadowed when a very popular Senior in high school, Mallory Johnson, dies in a car crash on the way home from a party. This was not the only tragedy this area has had to face, a few days later two not so popular kids were found shot to death. This happening all after another car accident just two months earlier where two other youths were killed and another was severely injured. To stay the town in stunned by these events is an understatement. Mallory was known not to drink or do drugs so what caused her to go off the road is a mystery and is her accident connected to any of the other deaths. As usual Deborah’s many nieces and nephews are always dropping by for a visit, plus it is time for the annual cookie baking party. All these kids either knew or went to school with the victims. So Deborah does what any judge/wife of a chief deputy sheriff would do, she keeps her eyes and her ears open. As she and Dwight share their gathered information they find the clues may connect to a death from several years ago. It is time to solve these mysteries before anyone else is lost and Dwight and Deborah are on the case. 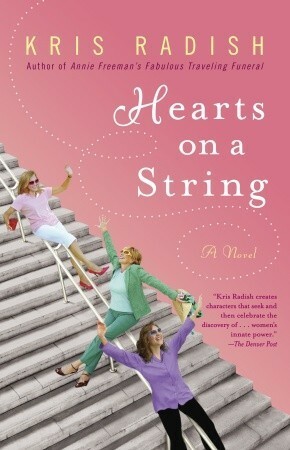 This has been one of my favorite series and I enjoy every trip into the world of Deborah Knott. The closeness and trials and tribulations of the whole family dynamic never disappoint. The mystery that tags along is an added bonus. The author is a wonderful storyteller and her characters continue to grown and develop. In this edition it was about the teenagers. I have to say I was very impressed in the way she took on a very relevant teen issue, cell phones and texting. She also makes us aware of dangerous things that can happen at teen parties, stupid pranks can have deadly consequences. She handled them without being preachy, she just put it out there and reminded us all about the dangers. This week the National Transportation Safety Board has recommended that all cell phone use be banned all non-emergency use of cell phones and other portable devices for drivers. This makes this story quite timely. I realize it was published last year but I didn’t get to it for last year’s holiday season and saved it for this year and I am glad I did. It helped me to remind my own kids of these dangers. Teenagers always think it can’t happen to them. In this story it happened to kids that probably felt exactly that way. The mystery was great but the message was gripped me and held me in this story. This is not your typical Christmas story but you knew that from the title. It is an excellent addition to this series. Christmas Mourning was from my private library collection. Before I started this blog I would I have told you that I don’t read any fiction that has any paranormal elements. I have never been a fan of fantasy, sci-fi or horror books. Now I have found I must qualify by former feelings. While I do not want to read anything having to do with zombies, vampires or werewolves, I am perfectly fine with ghosts, psychics and maybe even witches. The cozies I have read the past couple of years have actually been really interesting and entertaining. Take the books by today’s guest. When I read the first book in the series, If Walls Could Talk, I equated the the ghosts with the quirky characters every good cozy needs. 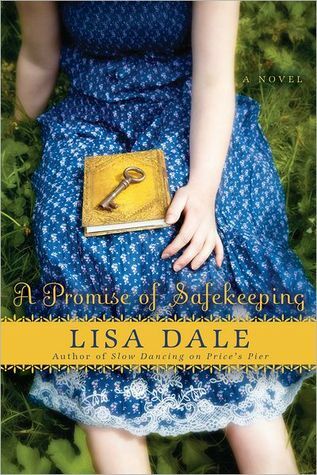 In her new book, Dead Bolt, there are ghosts that have definitely overstayed their welcome. Again very good characters for a cozy mystery. So while I won’t be reading any of the Twilight novels anytime soon, Juliet and her ghostly characters are always welcome on my bookshelf. I am so glad she is here today!!! Thanks for inviting me Lori! People often ask me how I started writing about haunted mansions. The answer’s simple: I used to work in them. I remember my first experience well. My assistant Bryan and I were working in a fancy Pacific Heights mansion at two in the morning, because when you’re in the specialty painting business, you’re usually the last one in on remodeling jobs. You come in after the plumbers, the electricians, the carpenters and drywall layers and stonemasons and regular painters. And since things always run over schedule, the last folks on the job wind up painting (or in this case, gold gilding) all night. Bryan ran out to the truck to grab supplies. I was concentrating on applying gold gilt to door trim when I heard…something. It sounded like steps overhead, pacing back and forth. But I was the only person in the house. The moment Bryan returned, the noises subsided. After much cajoling on my part, Bryan finally went upstairs to investigate with me. There was nothing in the bedroom, or anywhere else on the second floor. It had been my imagination…or was it? On the way back down, I would have sworn I felt a cold spot – a truly frigid gust of air—at the top of the stairs. Bryan noticed nothing. Much later I was speaking with the homeowner, who had lived in the house when he was a child and had returned years later to purchase it. He told me that someone they called Old Man McCray used to live in the house and had “died of a broken heart”; his body was found in the bedroom directly above the living room. It doesn’t take much to imagine ghosts roaming the halls of old houses. I adore historic structures, in large part because the traces of the past seem so very much at hand. So when people ask: where do you get your ideas? I always think to myself: The problem isn’t finding ideas; it’s deciding which ones to include, and which to leave out. Here’s another example: San Francisco’s Atherton Mansion, at 1990 California Street, which was built in the late 1800s by Dominga Atherton. Dominga lived there with her daughter Gertrude and son-in-law George. Apparently they weren’t a very happy family. According to legend, George tried to escape his situation by running off to Chile, but died at sea. The crew preserved his body in a barrel of rum and sent it back to San Francisco, where it was left on the front step to be opened by the butler, who discovered his master pickled in rum. Now I ask you…who could make this stuff up? The tragic story of the Atherton Mansion served as the original inspiration for the plot of Dead Bolt (second in my Haunted Home Renovation series), in which Mel Turner, a general contractor, is renovating a historic Queen Anne Victorian and comes upon the spirits of a very unhappy family. But of course as I write, I take artistic license with history in order to propel the story forward and to suit the series. But still…a body in a keg of rum? That’s the sort of detail that’s too good to pass up for this mystery writer! But then again, every story takes unanticipated twists and turns, almost as though there were spirits at work, hovering over the keyboard, guiding the tale. How about you? Have any of you ever felt a…presence of some sort in an old building? I’d love to hear your story! The ghosts aren’t the only ones standing in the way of the renovations. A crotchety neighbor, Emile Blunt, secretly wants this house, and could be behind some of the disturbances. But when Emile is found dead, it’s Mel who appears guilty. Now she must restore the building-and her reputation-before it’s too late! I was first drawn to this series because I used to build and remodel houses, then I enjoyed these wonderful characters and couldn’t get enough. Mel Turner is a take charge kind of gal, very organized, meticulous and not afraid of much except maybe getting her heart broken. She also has a special gift that at times is as much a curse as a blessing. With traits like these readers can’t help but care about her as we take each step right along with her, up those attic stairs or home to her Dad, Stan and Caleb, or even into those confusing romantic situations. She is funny and smart, the kind of friend you would want to tag along with, even when she’s off trying to get a family of ghosts to move along and out of the house she desperately wants to finish renovating. This book is fun, entertaining with perfect amounts are mystery, mayhem and haunting characters. I loved every word!! 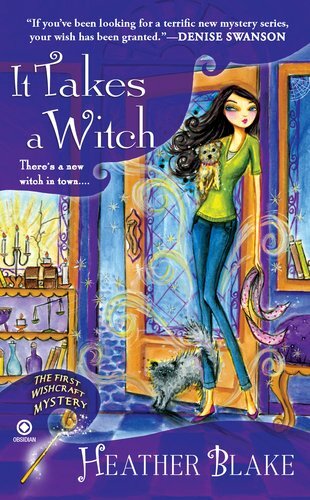 Juliet Blackwell is the nationally bestselling author of the Witchcraft Mystery series, which features a misfit witch with a vintage clothing store in San Francisco’s Haight Ashbury neighborhood (Secondhand Spirits, A Cast-Off Coven, Hexes and Hemlines, and In a Witch’s Wardrobe, coming 6/12). The Haunted Home Renovation series began last December with the release of If Walls Could Talk, also a national bestseller; Dead Bolt is second in the series. Under the pseudonym Hailey Lind, Juliet penned the Art Lover’s Mystery series with her sister Carolyn–including the Agatha-nominated Feint of Art. Arsenic and Old Paint is the latest in the series. A former anthropologist and social worker, Juliet has worked and studied in Mexico, Spain, Cuba, Italy, the Philippines, and France. She now lives in a happily haunted house in Oakland, California, where she is a muralist and portrait painter. She was a two-term president of Northern California Sisters in Crime. By SelectingTheir Favorite Way To Follow. A group of women meet for the very first time in an airport bathroom in Florida. They seem to come together while helping one of the women retrieve her cell phone that has fallen into the toilet. Just as soon as the phone is saved an announcement shocks them all. The airport is closing due to a freak storm. No flights are going anywhere. Their choices are few, camp out in the airport with hundreds/thousands of other people for God knows how long or share a luxury hotel suite. They choose the hotel suite of course, and that is when this spur of the moment decision takes them on a very unexpected trip that could change their lives. This was not my favorite Kris Radish book but after a slow start I really did enjoy it. This random group of women thrown together under strange circumstances and trying to cope with their huge differences was interesting, funny, sad and at times pretty unbelievable but I just went with it. Each woman was exceptional in their own way, handling some kind of stressful circumstances in each of their own lives and by sharing their stories it helped them to develop a weird type of bond. The psychic convention and another back story were a little over the top and I am not sure if these elements were even necessary to a book that may have been stronger without them. I didn’t like this one as much as I did The Elegant Gathering of White Snows, but it’s a engaging story of unlikely friendships. To keep up with Kris be sure to check out her web page. Kris was born in Wisconsin and attended the University of Wisconsin-Milwaukee. She now lives in Florida but I am proud to add her to my list of Wisconsin Authors. I found out about this book on Jennifer’s blog, Rundpinne. She is taking a medical leave of absence from her blog so please keep her in your prayers. She is personally responsible for a great deal of the books on my To-Be-Read shelf and my wish list. Get Well Soon Jennifer. This book was from my personal collection.